Serros' Fish & Poultry Co. This painting accompanies the Orlando Remembered exhibit at the Downtown Orlando Information Center, located at 201 South Orange Avenue in Downtown Orlando, Florida. The painting was created by James Stoll, who has contributed various works of art, as well as some scale model replicas, to several Orlando Remembered exhibits. 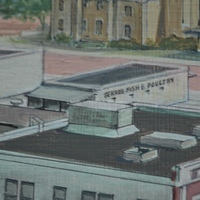 This particular portion of the painting features Nick Serros' Fish & Poultry Company sometime around 1938. Nick Serros (b. 1888), the company owner, was born in Greece in 1888 and immigrated to the United States in 1923. He opened his business in the late 1930s. The business remained on the block until it was bought out to make way for the CNA Tower and Barnett Plaza. In 1941, Serros' held a location of 117 South Court Street, but moved to 37 East Jackson Street by 1943. The following year, the business was listed at 37-41 E. Jackson and remained at that location until 1952. Original color painting by James Stoll: Orlando Remembered Exhibit, Downtown Orlando Information Center, Orlando, Florida. Original color digital image by Robert Randall, September 22, 2014. Orlando Remembered Exhibit, Downtown Orlando Information Center, Orlando, Florida. Downtown Orlando Information Center Collection, Orlando Remembered Collection, Orlando Collection, Orange County Collection, RICHES of Central Florida. Originally created by James Stoll. Copyright to this resource is held by the Orange County Regional History Center and is provided here by RICHES of Central Florida for educational purposes only. R. L. Polk & Company. "Street Directory." Buyers' Guide and Complete Classified Business Directory. Richmond, Va: R. L. Polk, 1940. R. L. Polk & Company. "Street Directory." Florida Polk's Orlando City Directory: Including Winter Park and Orange County. Richmond, Va: R. L. Polk, 1941. R. L. Polk & Company. "Street Directory." Florida Polk's Orlando City Directory 1943-44: Including Winter Park and Orange County. Richmond, Va: R. L. Polk, 1944. R. L. Polk & Company. "Street Directory." Florida Polk's Orlando City Directory: Including Conway, Maitland and Winter Park. Richmond, Va: R. L. Polk, 1945. R. L. Polk & Company. "Street Directory." Florida Polk's Orlando City Directory 1946-47: Including Winter Park and Orange County. Richmond, Va: R. L. Polk, 1947. Stoll, James. “Nick Serros' Fish & Poultry Company.” RICHES of Central Florida accessed April 18, 2019, https://richesmi.cah.ucf.edu/omeka/items/show/4597.